Cushion, chair and blocks not included. This play panel set from Children's Factory features four big screens in rainbow colors. Each 4'x5' screen can be arranged vertically or horizontally. 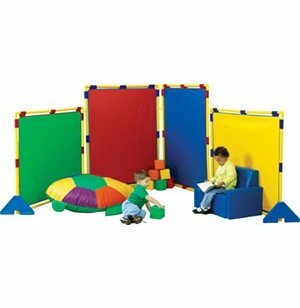 Colorful room dividers can be used to separate different activity stations, divide rest and play areas or conceal storage areas. Custom Configuration: Panels can be set up vertically or horizontally to screen off areas. 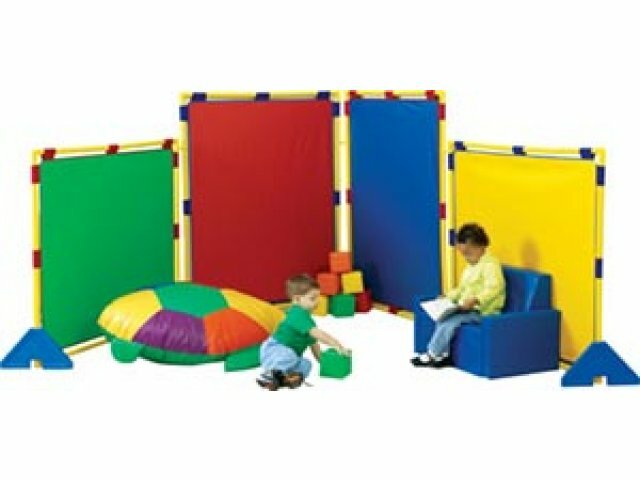 Conveniently Sized: 4'x5' play panels are appropriate for preschool or kindergarten classrooms as well as daycare centers. Complete Set: Includes four panels and two molded weighted plastic pedestal legs for stability. Space Saver: Flexible hinges link together and enable panels to be folded up and stored. Low Maintenance: Hygienic nylon-covered vinyl surfaces are easy to clean.